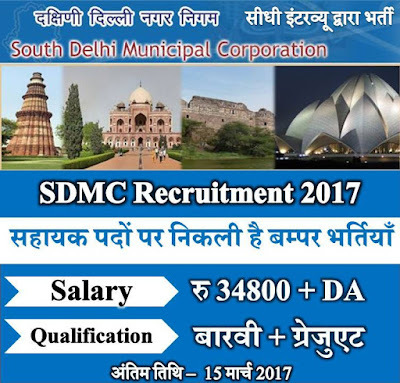 A Walk-in Advertisement has been advertised by South Delhi Municipal Corporation titled as SDMC Recruitment. Candidates who are interested can apply by appearing in an interview. It is great chance for the jobless to start their career as Asst Engineer so for more details about South Delhi Municipal Corporation Recruitment you can check this entire page which is well structured as per your concern. Aspirants need to get their application form through online mode by following the details given below and then have to appear for an interview from 15/03/2017 to 17/03/2017. Here we’ve provided other essential details about SDMC Recruitment 2017 on this page for convenience of our visitors so please have a look and apply as soon as possible. Candidates who are applying for SDMC Jobs, they must have degree in relevant discipline from any recognized university with good academic records or equivalent with 2 years professional experience and valid GATE score (2015 or later). Candidates who are going to apply for Assistant Engineer post their age must not exceed 30 years for general category. Age relaxation for reserved categories will be applicable as per the rules of the organization. Selected candidates against will get an impressive and attractive amount of salary as only an initial pay band plus grade pay of Rs. 9300-34800/- + 4600/- + existing DA as per 6th CPC by the management panel of the company. Eligible contenders will be selected by the company as per their rules or on the basis of candidate’s performance. The organization will conduct Interview to check candidate’s eligibility. Then on the home page applicants must hit on “South Delhi Municipal Corporation” link. Select link “Contractual Engagement of Assistant Engineer (Electrical), Assistant Engineer (Auto) & Assistant Engineer (Mechanical) on basis of valid gate score”. After this a new instruction page will be opened containing all the details and you can read it. Then, download the resume format to apply, Fill the application form with all the relevant details and also attaches all the Xerox copy of qualification, caste, date of birth certificates etc. Now appear for walk-in interview to address below. Candidates, who want to collect more information about SDMC Recruitment 2017 or any other information you may stay connect with us by pressing CTRL + D or use our free email service. I want to apply for SDMC Recruitment 2017, will you please tell me something about the selection procedure and syllabus for the test...?? ?